From now on the monthly kite meeting of NCB is held in the Domaine Solvay – Chateau de La Hulpe, in B-1310 La Hulpe and this on the last Sunday of every month. (see calender). These are the facilities for Parking your car. Near to 111 Chaussée de Bruxelles (near to the entrance gate, but little space available). GPS coordinates = 50°43’50.40”N and 4°27’04.00”E of the Fondation Folon. If the weather is fine, we advise you to be there before 2 pm (you won’t be alone). From the Chaussée de Bruxelles, follow the arrows “Fondation Folon – Ferme du Chateau” (brown signs) to the Castle. It’s a walk of about 1 km on a slow slope. 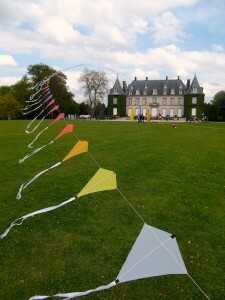 From the Gaillemarde Parking, follow the signs “Fondation Folon – Ferme du Chateau”, walk to the Castle in a 10 minutes walk. The tavern “l’Homme Bleu” (at the Ferme) provides food and drinks from 11 am to 6 pm.